peel the skin, wash and cut into dices the pumpkin . heat the oil in a wok or a non- stick pan, pop the fenugreek seeds and chana dal. mix well add salt cover and cook on low flame for 10 minutes. remove the cover add dry mango powder, sugar then mix again very well, switch off the flame. 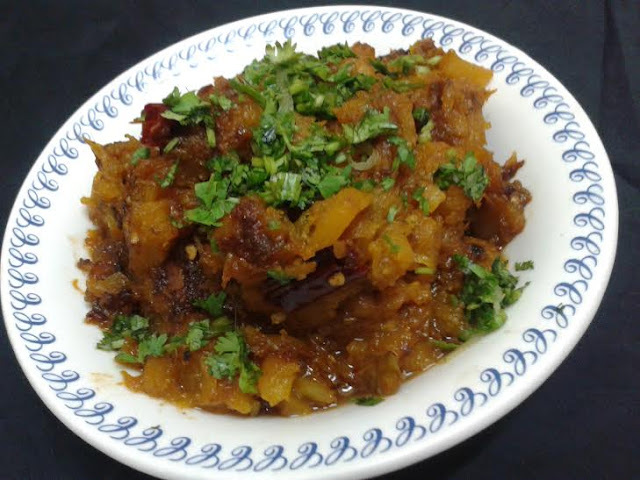 garnish with coriander leaves, serve with paratha/. अब कढ़ाही में तेल गरम करें और मेथी दाने के साथ चना दाल को चटका लें . note-- you can also add dried mango pieces instead of dry mango powder .